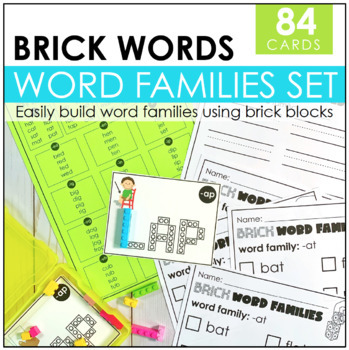 This set includes 84 brick task cards that students can manipulate to create and learn CVC words in specific word families. 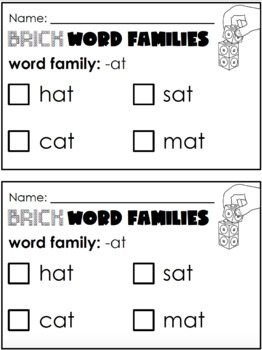 Recording sheets and a word families poster is also included. 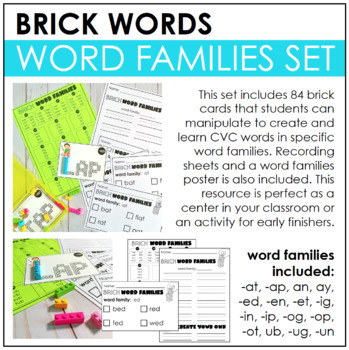 This resource is perfect as a center in your classroom or an activity for early finishers. Task cards fit perfectly in the 4x6 photo box cases. 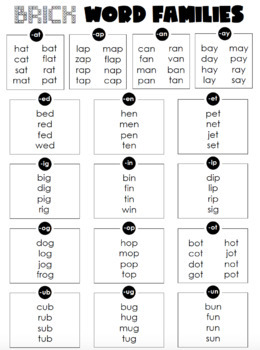 How can I earn TPT credits to use on future purchases? Please go to your My Purchases page (you may need to login). Beside each purchase you'll see a Provide Feedback button. Simply click it and you will be taken to a page where you can give a quick rating and leave a short comment for the product. Each time you give feedback, TPT gives you feedback credits that you use to lower the cost of your future purchases. I value your feedback greatly as it helps me improve current (and future) products to best meet your needs. How can I be the first to know about my new discounts, freebies and product launches? Please e-mail me at aperfectblendteaching@gmail.com with any questions.